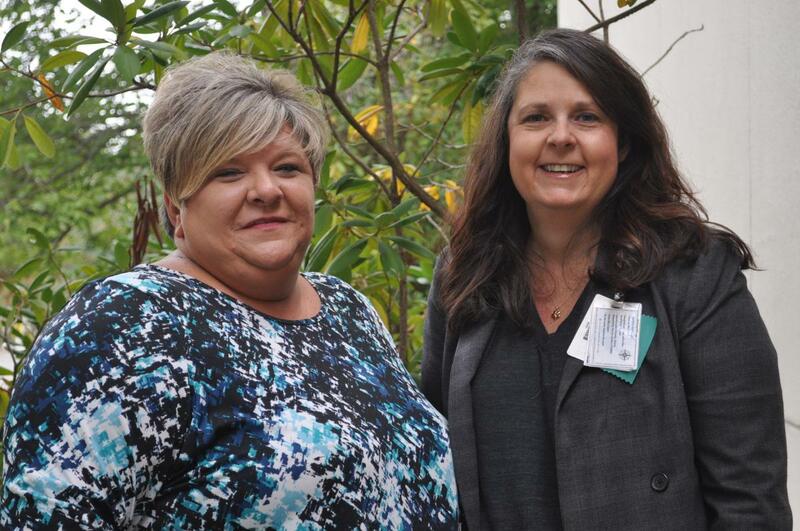 Foothills Health Network case manager Jada Scruggs and network coordinator Michele Trofatter work to build the network's programs and relationships. The mission of Foothills Health Network, located in Polk County, NC, is to improve the health of people living in Polk County and neighboring communities by increasing access to coordinated, quality care and cultivating community engagement. We envision a healthy community with engaged citizens, community organizations and collaborative health care partners. Michele Trofatter, network coordinator of Foothills Health Network, was interviewed by NCHN’s director of member services to share information on the network’s characteristics, key learnings, accomplishments and challenges. A: We are a network for the uninsured, low-income population of Polk County in North Carolina to help residents access primary care, prescription assistance, mental health services, and some specialty services, including diabetes management. We represent a collaborative effort among St. Luke’s Hospital; The Free Clinics; Blue Ridge Community Health Services; and Polk Fit, Fresh and Friendly, which is a local wellness coalition. We received a HRSA Network Development Grant in September of 2014. I was hired in January 2015, and we kicked off in June 2015. We have a steering committee comprised of representatives from all the network members. I’m an official employee of St. Luke’s. Other network staff are employed at other member organizations. Q: What are some of the benefits that network members receive? A: I think what’s most beneficial is they’re now able to have open dialogue with each other, and when we have competition issues with someone wanting to move into our county, we’ve been able to be the mediator to minimize the competition and maximize the collaboration. We’ve been able to broker the relationships. I’ve done the best when I hear rumbling that so-and-so is coming and going to take our patients. I get them all at a meeting to talk about it, putting all the cards on table. We discuss how to work together, and so far it’s been successful. We focus on collaboration rather than competition. Organizations don’t always feel free to do that without a mediator, so I’ve been able to help guide and navigate the conversations. I didn’t expect to be in that role. My original expectation was we’d provide services to patients rather than being a broker to organizations that provide services. It’s been more about getting people to talk to each other. We have similar issues in Polk County with mental health services, not just primary care. Brokering those relationships has been the most successful aspect of our network. The original goal of the network is still there, but how we might get there is completely different than I imagined when taking the position. Q: Are there other types of organizations you’re recruiting for your network? A: We have partners that are helping carry out our mission and goals. We have general members that belong to the network who have as much of a voice as steering committee members. The only difference is the steering committee is comprised of those organizations that receive money from the grant, so those financial conversations are not appropriate for the full membership. Q: What have you found most difficult in starting the network? A: A couple of things were difficult. I came into an organization where this was their first government grant, which meant there was no prior path to follow. Also, of those individuals who wrote and applied for the grant, only one was still here when I was hired. Consequently, I started on very blank slate. Another big challenge came from the normal communication problems everybody goes through when convening a new coalition. Some of the normal jockeying for position and power and learning how to communicate within the group took time. Helping everyone to focus on building a network that would be here in ten years and not just continuing to discuss local issues without deciding on a course of action was frustrating at times. Q: What challenges do you face working in your rural environment? A: Our county is located on the Saluda Grade, the name from the old railway line up the mountain. Despite a county-wide transportation system, rural residents can have transportation issues. We are also a medically underserved area with health care access issues. We have a lot of people doing a lot of good things, but sometimes it’s hard to connect the communication about resources with the consumer. We have smaller churches that provide food pantries in addition to the larger one operated by Thermal Belt Outreach Ministries. We have a women’s shelter, kids’ dental services, a full spectrum of diabetes education and support services, and services specifically targeted to the senior adult population, to name a few. We have a lot of things, but they’re concentrated in one or two areas. It’s hard to know they exist or how to access them if you aren’t well connected to the information stream. There is a local newspaper, but in a population of 21,000 our readership is only about 5,000. Most communication happens through word of mouth. Getting information from frontline workers to consumers can be challenging. Q: On the flip side, what are the advantages of working in your rural area? A: One of the best things about being here is everyone knows everybody. If an issue comes up and you don’t know how to handle it, someone will be able to connect you with a resource or information. A recent new hire knew several people in our network from past connections. It’s amazing to me that so many people I’m working with have been around for a long time—less turnover than in metropolitan areas. These people understand their county. They’re a resource for our network. You meet all the important people right up front. Q: What’s been key to your network’s early success? A: I think much of our success has come from recognizing and drawing on the regional resources that have been available to help start the network. We haven’t tried to build every piece of the network from scratch. If someone already had a piece that was working well, we modified it and used it for the network. We have tried to be intentional about not duplicating existing services, but leveraging our inter-agency relationships to create success. The organized approach we’ve taken has made it a logical growth progression. It’s allowed programs to be successful because we’re getting the right people at the table. You’re stagnant until you get right people. I’d also like to give a special shout-out to our case manager, Jada Scruggs. She’s the third one we’ve had since the network started. She’s been instrumental in growing the program and providing services to uninsured residents. Q: Based on your experiences, what advice would you give to a network leader starting in a similar role? A: I would tell them to be a listener, to begin with and be open to all the information and viewpoints, but not to lose their own sense of direction. Be willing to listen to all the different things, because having that ability to listen and be flexible is going to allow you to create the network that’s right for your community.